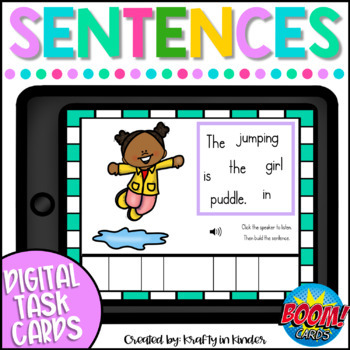 This is a 20 card deck of interactive digital task cards (Boom Cards) for sentence building with Spring themed pictures and sentences. 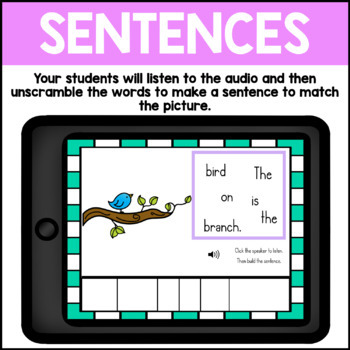 Students will look at the picture and click the speaker to listen to the sentence. Students will then drag the words from the word bank into the correct order to complete the sentence. When finished, students will click SUBMIT and their work will be checked. If correct, they will move on to the next card. If a word is misplaced, they will be able to correct the sentence and resubmit. This set includes SOUND! Throughout the game, there are speakers that can be clicked on to hear directions and the sentences. Perfect for non-readers, students with limited vocabulary, and ELLs. Cards will appear in a randomized order every time the game is played. Only 20 cards will show at a time, ensuring that each time the student plays, they will se a different set of cards. They are SELF-CHECKING which gives the student immediate feedback. 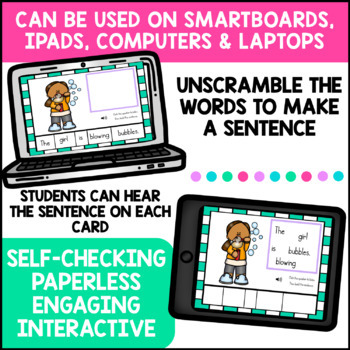 These cards can be played on any digital device (iPads, SmartBoard, Chromebook, computers) with internet connection. 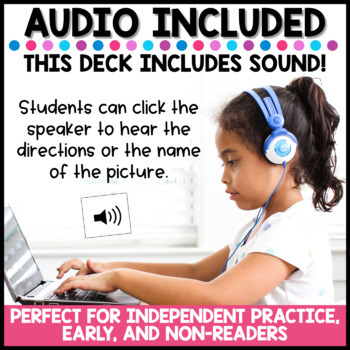 They are perfect for whole group and small group instruction as well as literacy centers, stations, morning work, assessment, extra practice, etc!